1908 Train #112 Redwood Empire Route, ink & watercolor, 5x10"
Our sketch group took a train trip to Sacramento and visited the California State Railroad Museum. The enormous building ( 225,000 square feet) contains many full-sized trains. This one called out to me so after looking around a bit, I sat against a pillar on the hard floor and started drawing. I used pencil first to get the basic shapes down since it was so complicated. Then I switched to ink and the time flew by. A friendly docent started talking to me and I realized I only had a few minutes left before we had to leave for our train ride home, so I quickly added watercolor, which I touched up a bit when I got home. We walked from the train museum to the train station for our ride back home. 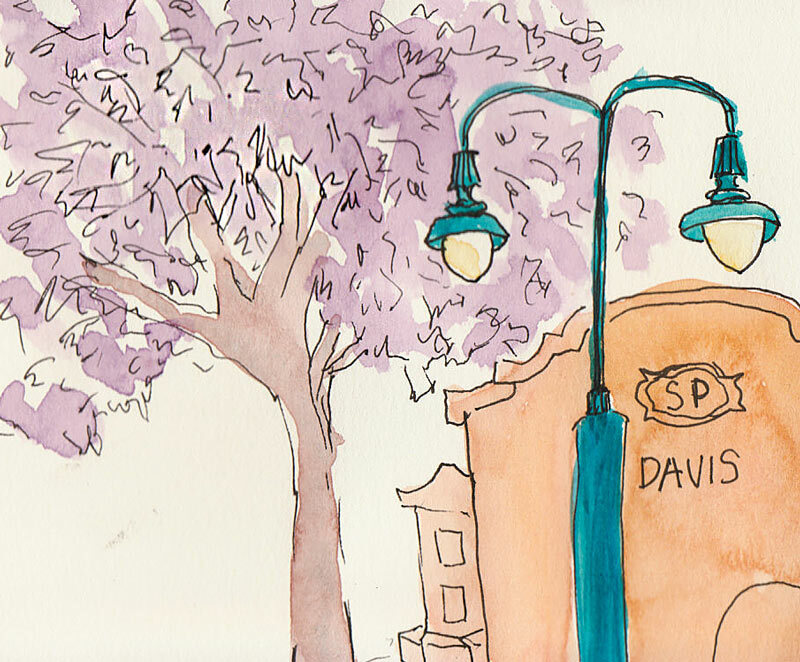 When we stopped at the Davis station I tried to draw it. But it must have been a “whistle stop.” I barely had time to sketch the tree and a bit of the lamp-post when we were rolling again. 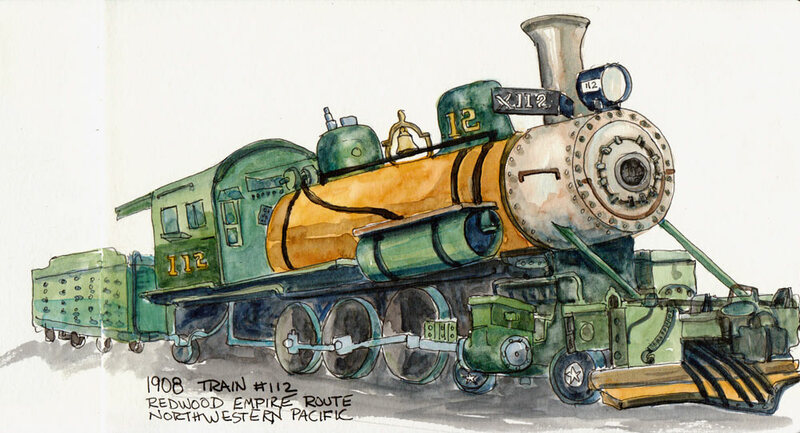 Gorgeous painting of Engine 112, Jana! And a wonderful tale of the whole train adventure. Thank you! I hope your group is going to the Dr. Sketchy’s Burlesque Queens marathon this weekend and will post sketches from there! I’d never heard of Dr. Sketchy and found that there will be a sketch outing in Asheville, NC, about an hour or so from me, in May. What fun! I recently gave myself a copy of Felix Scheinberger’s sketchbook (http://www.felixscheinberger.de/) and loved his sketches from Dr. Sketchy in Berlin. What a great train engine sketch!!! you guys find the best things to do! And have i missed the video of your studio? Very nice job on such a complicated subjet. I’ve been thinking about you a lot lately = I’m hoping to fit in a trip to see Claire before September. Will you be around? Nothing is set up yet, and the summer is looking complicated, but I really want to try. 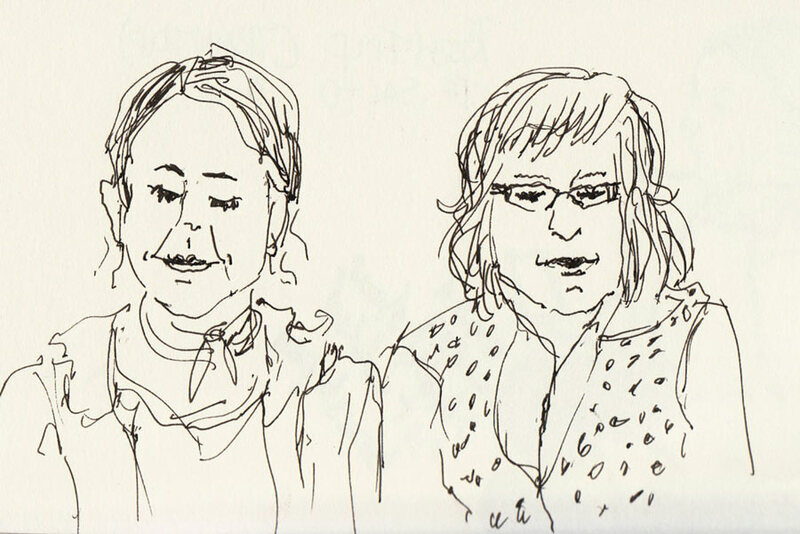 I LOVE this train sketch, Jana! I so admire your sketching abilities, which more and more I find I don’t have the patience for, grabbing a paint brush- or even a palette knife- instead. Your work gets better and better. Beautiful!